Spending on paid media worldwide will increase 7.0% in 2017 to $584.14 billion. 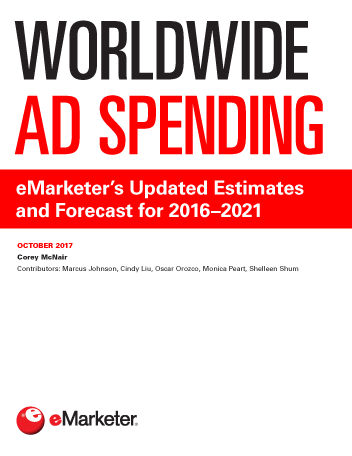 Growth is largely on pace with eMarketer’s previous forecast, with investments in mobile advertising driving these increases. This year, mobile will account for 24.4% of total ad expenditures. China will remain one of the largest contributors to global advertising growth, largely due to advertisers there investing more toward mobile. Total ad spend will climb 14.7% in the country this year to $84.54 billion. To compare, China’s mobile ad market alone is now larger than Latin America’s total ad spend. The US, China, Japan, the UK and Germany will continue to be the top five ad markets throughout the forecast period. The US will rank first with $205.06 billion in paid media outlays this year. By 2018, China’s ad spend will surpass that of Japan, the UK and Germany combined. Ad spending growth will hover between 4.9% and 8.3% each year of the forecast. Investments in mobile, especially in regions where mobile is the point of entry for internet access, is fueling this increase. Asia-Pacific—notably China—will see the fastest total ad spend growth of any region, rising 11.5% this year. Latin America will be close behind, with ad outlays climbing 10.0%. Digital ad spending worldwide will grow slightly faster than expected, jumping 19.1% this year to $228.44 billion. Digital will continue to exhibit robust growth, expanding from 39.1% of total media ad spend in 2017 to 49.6% by 2021. Digital’s growth is primarily due to advertiser’s high interest in mobile ad formats. Growing competition for mobile ad space has led to climbing prices. This year, mobile ad spending worldwide will total $142.78 billion, up 33.6% from 2016. This will represent nearly one-quarter of total media ad spending. "In 2017, global digital ad spending will increase 19.1% to $228.44 billion. Mobile ad investments will drive gains, accounting for 62.5% of digital ad outlays."